If you've been reading me for any length of time you already know what a huge fan of Edith Wharton I am. I find her writing to be so easy to rest in. What I mean is that I get so caught up in the story that I forget that I'm actually reading a book. It's not the vividness of the descriptions, though the descriptions are plentiful. It's something clear and unnoticeable about the writing that I find hard to describe. Her ghost stories are not all wonderful and not all in such a flowing and descriptive manner but they are all Wharton's own. You can Google Wharton or Short Story Sunday to see some of the stories that I reviewed here. But the last few stories didn't get a place of their own; and I'm not likely to get around to them now that the book has been returned to the library. But I did want to tell a little bit about my favorite story. 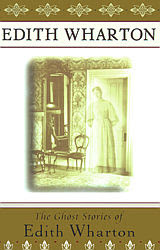 Miss Mary Pask was a ghost story with a somewhat humorous twist. The protagonist visits the sister of a friend, then remembers that the sister had died. He ends up having a surreal conversation with Miss Pask where she makes comments such as, "I'm so lonely. No one ever visits me since I died." But that's not the twist. I highly recommend you read it for yourself. Finishing this book marked the end of my RIP II Challenge books. I didn't finish on time but I did finish. Thank you, thank you Carl for all your encouragement and imagination, generosity and passion. It was a lot of fun. I also get to count this as the second book completed for the Reading the Author Challenge. That's two birds with one stone. Yay for me! Congrats on finishing! What's your favourite Wharton? This is great, glad you enjoyed the stories. I have another Wharton on my TBR pile for a few months down the line but I am already looking forward to it. Wharton is not someone I have read before but your hight praise means it is someone I seek out. Any recommendations for books to start with? Eva-The House of Mirth was my first experience with Wharton and I think it is still my favorite but they are all good. Verbivore-which Wharton are you planning to read? Book-Madame De Treymes is a novella that gives a good idea of Wharton's writing style and favorite subjects without committing yourself to 300 or more pages if you decide you don't like it. It might be harder to find though. Thanks Petunia, I will see if my library has it. I've only read 2-The House of Mirth and Ethan Frome. I have to say Ethan Frome is one of my all-time favorites. Kimmie-I haven't read Ethan Frome yet but I plan to before the end of the year.